ADP private sector employment is always reported the Wednesday before the Friday where U.S. government employment data is released. Since it varies from what the government reports relatively substantially it is usually given less attention but this morning ADP released a -10,000 private sector contraction in employment. This was my fear for Friday - that we'd see the first contraction in the private sector in many months. Now with that said, the government can add 100-125K "birth death jobs" [Jan 27, 2008: Monthly Jobs Report & Birth Death Model] and inflate away the losses* as it has been doing a great job of during the entire Great Recession so with the 'help' of that piece of fiction private sector jobs might still show positive when the government reports their data Friday..... but either way, we seem to have passed back over to at best marginal job growth far below that needed simply to keep up with population growth. Worst case? See the cartoon at bottom of post for the new American nirvana. *please note you cannot just add or subtract birth death model jobs to the reported number to get the 'true' number. Whatever the case, futures could care less about ADP because Chinese PMI was +0.5 higher than last month and a factory gauge thousands of miles away is all that matters. 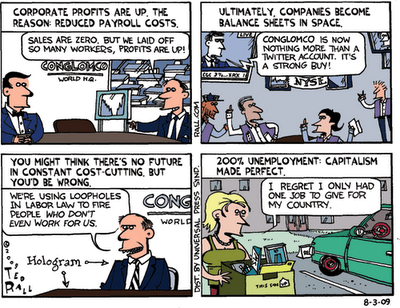 Or we can take the view that more job losses are great because it means higher profits. (I'll have a piece related to that in the next 24-48 hours!) To that end, hopefully we can get rid of all workers not in the C suite by 2014. Party on Garth.